Wheat germ is a type of whole grain. In general, whole grains have a fiber-rich outer shell called bran, and an inner layer of endosperm that houses and provides energy to the germ -- the grain's reproductive center. Wheat germ, which is part of the wheat kernel, is the reproductive center of the wheat plant and is packed with nutrients. Prior to the late 1800s, whole grains were a dietary stable. Refining was invented, in part, to reduce the cost of food. When whole grains are processed, the kernel -- the healthiest part of the plant -- is discarded to make the grain easier to chew and digest, and to extend its storage and shelf life. The endosperm is also broken into tiny fragments. No refrigeration is needed, either, since the beneficial oils, which would typically go bad, are removed. 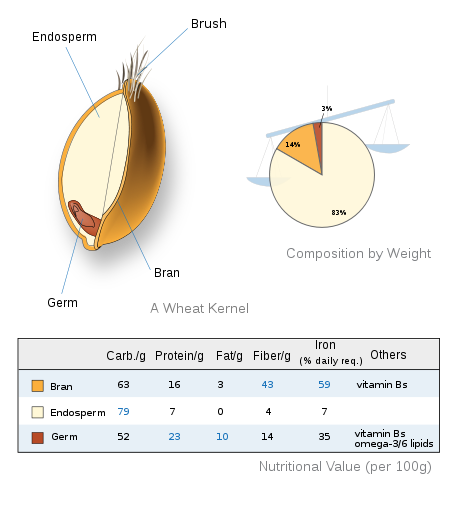 Wheat germ is a good source of healthy carbohydrates and fats, it's low in sugar and calories, and has no cholesterol. Two tablespoons of raw wheat germ is 60 calories and contains 1.5g of unsaturated fat, 9g of carbohydrates, 4g of protein, 2g of dietary fiber, and 2g of sugars. Wheat germ is especially rich in B vitamins, including vitamin B1 (thiamin), vitamin B6 (pyridoxine), and folate (also known as vitamin B9). These nutrients play an important role in mood regulation, energy production, and cardiovascular health. Another vitamin powerhouse in wheat germ, vitamin E is an antioxidant that may prevent artery blockages. It also has a hand in immune function, liver detoxification, and glucose level maintenance. Eating whole grains may significantly lower your chances of developing diabetes. Wheat germ is packed with protein, which is involved in many bodily functions including energy production, transporting nutrients, and tissue building and repair. Fiber helps control cholesterol and blood sugar levels, facilitates intestinal health and detoxification. Phytosterols in wheat germ control cholesterol. They are steroid compounds that resemble cholesterol and reduce LDL "bad" cholesterol. They also promote heart health. Wheat germ is rich in minerals, including iron, zinc, calcium, selenium, manganese, magnesium, and potassium. They are key to chemical reactions in the body as well as tissue repair. Combine 1tbsp of wheat germ and 6oz of Greek yogurt, your choice of berries (about 1/4 cup to 1 cup), 1/4 banana, 1 cup of low-fat or almond milk and ice cubes. Blend until smooth. Add non-fat or low-fat milk for a thinner smoothie. Use 1/4 cup of almonds for a nuttier flavor. For 20 minutes, steep 1 tbsp of wheat germ per 2 two cups of boiling water, then filter. When combining your ingredients for homemade waffles, add wheat germ. For a recipe that feeds three, use 1/2 cup of wheat germ. Wheat germ normally comes in fine or course powder form. You can add it to almost anything: protein shakes, cereal, yogurt, baked goods, even pasta. It's easy to get creative with wheat germ. Cancer treatment and prevention, specifically melanomas, colon cancer, and cancers of the head and neck. Patients who used fermented wheat germ did not exhibit any adverse side effects. Wheat germ is a good source of healthy carbohydrates and fats, it's low in sugar and calories, and has no cholesterol. Choosing whole grains over refined grains more often can significantly improve your health. 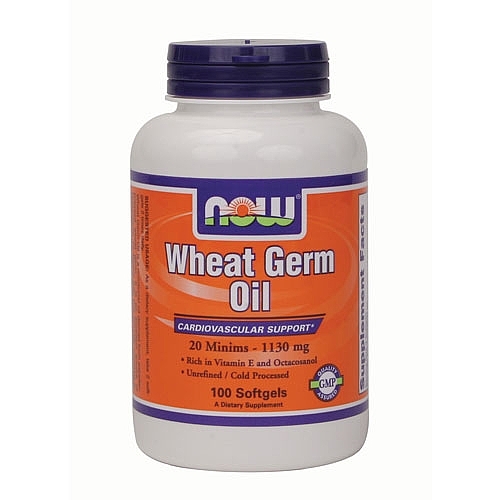 Avoid "defatted" wheat germ, which is processed by removing beneficial oils and vitamin E.
Wheat germ is perishable. Always refrigerate an open a container. Look out for rancid wheat germ. This can happen quickly during processing if it is exposed to air. Wheat germ is available in prepackaged containers at ordinary grocery stores and can be purchased by weight at bulk health food stores. At PricePlow, you can compare brands, quality and unique features of different wheat germ products and manufacturers. And our price aggregator will find the best deals out there. The Nutrition Source; Harvard School of Public Health; "Health Gains From Whole Grains"
Sign up for future Wheat Germ deals and coupons! 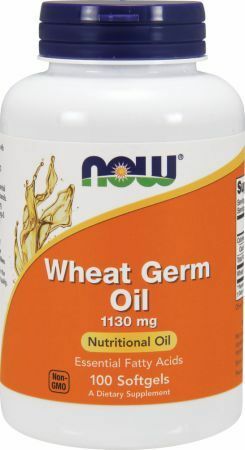 Click the button below to sign up for future Wheat Germ deals, news, and coupons!